While we're waiting for the swine flu epidemic to either burn itself out or dispatch most of civilization to "the Choir Invisible", here's some encouraging literature to read in the meantime: Marvel Comics' AMAZING adaptation of the classic Stephen King novel The Stand. The ongoing series, written by Roberto Aguirre-Sacasa and illustrated by Mike Perkins with oversight by King himself, is scheduled to span thirty issues consisting of five story arcs. The first, "Captain Trips", just wrapped up and you should be able to find the collected trade paperback version at most well-stocked bookstores. If you've ever read the novel, you can probably figure out that "Captain Trips" covers the first several days of the superflu plague that wipes out more than 99% of humanity. 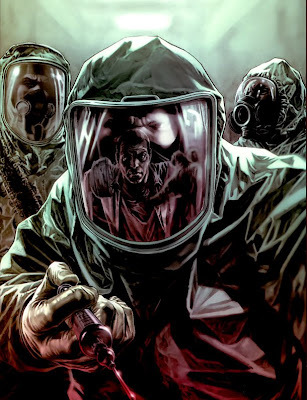 The next and current arc, "American Nightmares", deals with what happens to those lucky (or unfortunate) enough to have survived the pandemic. As a longtime fan of The Stand I can heartily recommend buying this. Marvel's The Stand is probably the finest version of King's tale outside of the original book that I've seen yet. Yeah, the TV miniseries was pretty good (can you believe it'll be fifteen years next month since it first premiered?) but as a graphic novel there's much more room and liberty to faithfully recreate The Stand's plot and its characters. Well worth tracking down and keeping up with. Got to agree, an amazing adaptation.